This article is about the South Asian ethnic group. For other uses, see Siddi (disambiguation). Not to be confused with Sindhi people. Karnataka, Gujarat, Maharashtra, states of India, Sindh and the Balochistan province of Pakistan. The Siddi (pronounced [sɪd̪d̪iː]), also known as Siddhi, Sheedi, or Habshi (Kannada:ಸಿದ್ಧಿ), are an ethnic group inhabiting India, Sri Lanka, Afghanistan and Pakistan. Members are descended from Bantu peoples from Southeast Africa. Some were merchants, sailors, indentured servants, slaves, and mercenaries. The Siddi community is currently estimated at around 50,000–60,000 individuals, with Karnataka, Gujarat and Hyderabad in India and Makran and Karachi in Pakistan as the main population centres. Siddis are primarily Sufi Muslims, although some are Hindus and others Roman Catholic Christians. Siddi Girl from Yellapur Town of Uttara Karnataka District, Karnataka, India. There are conflicting hypotheses on the origin of the name Siddi. One theory is that the word derives from sahibi, a Arabic term of respect in North Africa, similar to the word sahib in modern India and Pakistan. A second theory is that the term Siddi is derived from the title borne by the captains of the Arab vessels that first brought Siddi settlers to India. These captains were known as Sayyid. Similarly, another term for Siddis, habshi, is held to be derived from the common name for the captains of the Abyssinian ships that also first delivered Siddi slaves to the subcontinent. 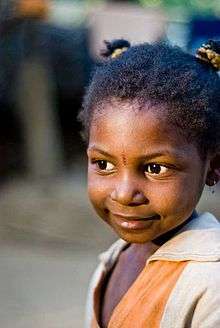 Siddis are also sometimes referred to as Afro-Indians. Siddis were referred to as Zanji by Arabs; in China, various transcriptions of this Arabic word were used, including Xinji (辛吉) and Jinzhi (津芝). 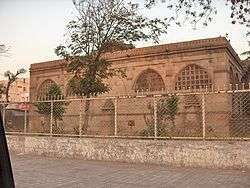 A fine example of Indo-Islamic architecture, the Sidi Saiyyed Mosque in Ahmedabad, India was constructed in 1572 by Sidi Saiyyed, a slave of Sultan Ahmad Shah. The first Siddis are thought to have arrived in India in 628 AD at the Bharuch port. Several others followed with the first Arab Islamic invasions of the subcontinent in 712 AD. The latter group are believed to have been soldiers with Muhammad bin Qasim's Arab army, and were called Zanjis. Later the Siddi population was added to via Bantu peoples from Southeast Africa that had been brought to the Indian subcontinent as slaves by the Portuguese. While most of these migrants became Muslim and a small minority became Christian, very few became Hindu since they could not find themselves a position in the traditional Hindu caste hierarchy. Flag of the Siddis from Murud-Janjira, an important vassal of the Mughal Empire. Some Siddis escaped slavery to establish communities in forested areas, and some even established the small Siddi principalities of Janjira State on Janjira Island and Jafarabad State in Kathiawar as early as the twelfth century. A former alternative name of Janjira was Habshan (i.e., land of the Habshis). In the Delhi Sultanate period prior to the rise of the Mughals in India, Jamal-ud-Din Yaqut was a prominent Siddi slave-turned-nobleman who was a close confidant of Razia Sultana (1205–1240 CE). Although this is disputed, he may also have been her lover. Malik Ambar, a prominent Siddi figure in Indian history at large, is sometimes regarded as the "military guru of the Marathas", and was deeply allied with them. He established the town of Khirki which later became the modern city of Aurangabad, and helped establish the Marathas as a major force in the Deccan. Later, the Marathas adapted Siddi guerrilla warfare tactics to grow their power and ultimately demolish the Mughal empire. Some accounts describe the Mughal emperor Jahangir as obsessed by Ambar due to the Mughal empire's consistent failures in crushing him and his Maratha cavalry, describing him derogatorily as "the black faced" and "the ill-starred" in the royal chronicles and even having a painting commissioned that showed Jahangir killing Ambar, a fantasy which was never realised in reality. Harris (1971) provides an historical survey of the eastward dispersal of slaves from Southeast Africa to places like India. Hamilton (1990) argues that Siddis in South India are a significant social group whose histories, experiences, cultures, and expressions are integral to the African Diaspora and thus, help better understand the dynamics of dispersed peoples. More recent focused scholarship argues that although Siddis are numerically a minority, their historic presence in India for over five hundred years, as well as their self-perception, and how the broader Indian society relates to them, make them a distinct Bantu/Indian. Historically, Siddis have not existed only within binary relations to the nation state and imperial forces. They did not simply succumb to the ideologies and structures of imperial forces, nor did they simply rebel against imperial rule. Siddi Folk Dancers, at Devaliya Naka, Sasan Gir, Gujarat. Supposedly presented as slaves by the Portuguese to the local Prince, Nawab of Junagadh, the Siddis also live around Gir Forest National Park and Wildlife Sanctuary, the last refuge in the world of the almost extinct Asiatic lions, in Junagadh a district of the state of Gujarat, India. On the way to Deva-dungar is the quaint village of Sirvan, inhabited entirely by Siddis, a tribe of Bantu descent. They were brought 300 years ago to from Portuguese colonial territories for the Nawab of Junagadh. Today, they follow very few of their original customs, with a few exceptions like the traditional Dhamal dance. Although Gujarati Siddis have adopted the language and many customs of their surrounding populations, some of their Bantu traditions have been preserved. These include the Goma music and dance form, which is sometimes called Dhamaal (Gujarati: ધમાલ, fun). The term is believed to be derived from the Ngoma drumming and traditional dance forms of Bantu East Africa. The Goma also has a spiritual significance and, at the climax of the dance, some dancers are believed to be vehicles for the presence of Siddi saints of the past. Goma music comes from the Kiswahili word "ngoma", which means a drum or drums. It also denotes any dancing occasion where traditional drums are principally used. The Siddis of Karnataka (also spelled Siddhis) are an ethnic group of mainly Bantu descent that has made Karnataka their home for the last 400 years. There is a 50,000-strong Siddhi population across India, of which more than a third live in Karnataka. In Karnataka, they are concentrated around Yellapur, Haliyal, Ankola, Joida, Mundgod and Sirsi taluks of Uttara Kannada and in Khanapur of Belgaum and Kalghatgi of Dharwad district. Many members of the Siddis community of Karnataka had migrated to Pakistan after independence and have settled in Karachi, Sindh. It has been reported that these Siddis believe that Barack Obama shares their genepool and that they wanted to gift a bottle of honey to him on his visit to India in 2010. 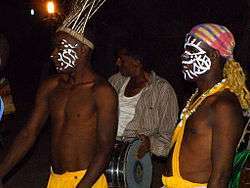 In the 18th century, a Siddi community was established in Hyderabad State by the Arab Siddi diaspora, who would frequently serve as cavalry guards of the Asif Jahi Nizam's irregular army. The Asif Jahi Nizams patronised them with rewards and the traditional Marfa music gained popularity and would be performed during official celebrations and ceremonies. The Siddis of Hyderabad have traditionally resided in the A.C. Guards (African Cavalry Guards) area near Masjid Rahmania, known locally as Siddi Risala. In Pakistan, locals of Bantu descent are called "Sheedi". They live primarily along the Makran Coast in Balochistan, and lower Sindh. In the city of Karachi, the main Sheedi centre is the area of Lyari and other nearby coastal areas. Technically, the Sheedi are a brotherhood or a subdivision of the Siddi. The Sheedis are divided into four clans, or houses: Kharadar Makan, Hyderabad Makan, Lassi Makan and Belaro Makan. The sufi saint Pir Mangho is regarded by many as the patron saint of the Sheedis, and the annual Sheedi Mela festival, is the key event in the Sheedi community's cultural calendar. Some glimpses of the rituals at Sidi/Sheedi Festival 2010 include visit to sacred alligators at Mangho pir, playing music and dance. Clearly, the instrument, songs and dance appear to be derived from Africa. In Sindh, the Sheedis have traditionally intermarried only with people such as the Mallahs (fisherpeople), Khaskeli (laborers), Khatri (dyeing caste) and Kori (clothmakers). Famous Sheedis include the historic Sindhi army leader Hoshu Sheedi and Urdu poet Noon Meem Danish. Sheedis are also well known for their excellence in sports, especially in football and boxing. Qasim Umer is one cricketer who played for Pakistan in 80s.The musical anthem of the ruling Pakistan Peoples Party, "Bija Teer", is a Balochi song in the musical style of the Sheedis with Black African style rhythm and drums. Younis Jani is a popular Sheedi singer famous for singing an Urdu version of the reggaeton song "Papi chulo... (te traigo el mmmm...)." Sheedis are largely populated in different towns and villages in lower Sindh. They are very active in cultural activities and organise annual festivals, like, Habash Festival, with the support of several community organisations. In the local culture, when there is a dance it is not performed by some selected few and watched idly by others but it is participated by all the people present there, ending difference between the performers and the audience. Sheedis in Sindh also proudly call themselves the Qambranis, Urdu: قمبرانی ‎; Sindhi: قمبراڻي‎, in reverence to Qambar, the freed slave of the Islamic caliph Ali. Recent advances in genetic analyses have helped shed some light on the ethnogenesis of the Siddi. Genetic genealogy, although a novel tool that uses the genes of modern populations to trace their ethnic and geographic origins, has also helped clarify the possible background of the modern Siddi. A Y-chromosome study by Shah et al. (2011) tested Siddi individuals in India for paternal lineages. The authors observed the E1b1a haplogroup, which is frequent among Bantu peoples, in about 42% and 34% of Siddis from Karnataka and Gujarat, respectively. Around 14% of Siddis from Karnataka and 35% of Siddis from Gujarat also belonged to the Sub-Saharan B haplogroup. The remaining 30% of Siddi had Indian or Near Eastern-associated clades, including haplogroups H, L, J and P.
Thangaraj (2009) observed similar, mainly Bantu-linked paternal affinities amongst the Siddi. According to an mtDNA study by Shah et al. (2011), the maternal ancestry of the Siddi consists of a mixture of Sub-Saharan and Indian haplogroups, reflecting substantial female gene flow from neighbouring Indian populations. About 53% of the Siddis from Gujarat and 24% of the Siddis from Karnataka belonged to various Sub-Saharan macro-haplogroup L sub-clades. The latter mainly consisted of L0 and L2a sublineages associated with Bantu women. The remainder possessed Indian-specific subclades of the Eurasian haplogroups M and N, which points to recent admixture with autochthonous Indian groups. Narang et al. (2011) examined the autosomal DNA of Siddis in India. According to the researchers, about 58% of the Siddis' ancestry is derived from Bantu peoples. The remainder is associated with local Indo-European-speaking North and Northwest Indian populations, due to recent admixture events. Similarly, Shah et al. (2011) observed that Siddis in Gujarat derive 66.90%–70.50% of their ancestry from Bantu forebears, while the Siddis in Karnataka possess 64.80%–74.40% such Southeast African ancestry. The remaining autosomal DNA components in the studied Siddi were mainly associated with local South Asian populations. According to the authors, gene flow between the Siddis' Bantu ancestors and local Indian populations was also largely unidirectional. They estimate this admixture episode's time of occurrence at within the past 200 years or eight generations. However, Guha et al. (2012) observed few genetic differences between the Makrani of Pakistan and adjacent populations. According to the authors, the genome-wide ancestry of the Makrani was essentially the same as that of the neighboring Indo-European speaking Balochi and Dravidian-speaking Brahui. From Africa...To Indian Subcontinent: Sidi Music in the Indian Ocean Diaspora (2003) by Amy Catlin-Jairazbhoy, in close collaboration with Nazir Ali Jairazbhoy and the Sidi community. Mon petit diable (My Little Devil) (1999) was directed by Gopi Desai. Om Puri, Pooja Batra, Rushabh Patni, Satyajit Sharma. Razia Sultan (1983), an Indian Urdu film directed by Kamal Amrohi, is based on the life of Razia Sultan (played by Hema Malini) (1205–1240), the only female Sultan of Delhi (1236–1240), and her speculated love affair with the Abyssinian slave Jamal-ud-Din Yakut (played by Dharmendra). He was referred to in the movie as a habshee. A Certain Grace: The Sidi, Indians of African Descent by Ketaki Sheth, Photolink, 2013. Shaping Membership, Defining Nation: The Cultural Politics of African Indians in South Asia (2007) by Pashington Obeng. 1 2 3 4 5 6 7 Shah, Anish M.; et al. (15 July 2011). "Indian Siddis: African Descendants with Indian Admixture". American Journal of Human Genetics. 89 (1): 154–161. doi:10.1016/j.ajhg.2011.05.030. PMC 3135801 . PMID 21741027. Retrieved 18 December 2012. 1 2 Albinia, Alice (2012). Empires of the Indus: The Story of a River. UK: Hachette. ISBN 0393063224. ↑ David Brion Davis, Challenging the boundaries of slavery (Harvard University Press, 2006), p. 12. ↑ Ci Hai 7(1): 125. ↑ Roland Oliver, Africa in the Iron Age: c.500 BC-1400 AD, (Cambridge University Press, 1975), p. 192. ↑ F.R.C. Bagley et al., The Last Great Muslim Empires, (Brill: 1997), p. 174. ↑ Brajesh Kumar, Pilgrimage Centers of India (Diamond Pocket Books, 2003), p. 154. ↑ Harris, J. E. (1971). The African Presence in Asia: Consequences of the East African Slave Trade. ↑ Obeng, P. (2007). Shaping Membership, Defining Nation: The Cultural Politics of African Indians in South India, p. xiii. ↑ Obeng, P. (2003), "Religion and empire: Belief and identity among African Indians in Karnataka, South India", Journal of the American Academy of Religion 71 (1), 99-120. ↑ "Siddis stray from tradition". Retrieved 5 December 2004. ↑ Shekhawat, Rahul Singh (n.d.), "Black Sufis: Preserving the Siddi's and its age old culture in India"
↑ Anil Budur Lulla, A Bottle of Honey for Our Brother Prez, Short Takes section, Open Magazine, 30 October 2010. ↑ "'Marfa' band of the Siddis 'losing' its beat". The Hindu. Hyderabad, India. 10 July 2011. Retrieved 19 September 2011. ↑ Ababu Minda Yimene (2004). An African Indian Community in Hyderabad: Siddi identity, its maintenance and Change. Greenwood. pp. 209–211. ISBN 3-86537-206-6. Retrieved 19 September 2011. ↑ Shanti Sadiq Ali (1995). The African Dispersal in the Deccan: from medieval to modern times. Oriental Longman. ISBN 81-250-0485-8. Retrieved 22 September 2011. 1 2 Sheedi Mela begins with ritual aplomb, The News International, 7 July 2008. ↑ Zaffar Abbas, "Pakistan's Sidi keep heritage alive", BBC News, 13 March 2002. ↑ "Manghopir urs a living tribute to Sheedi culture", Dawn 16 July 2007. ↑ "‘Hoshu Sheedi Day’ on March 23", Dawn, 21 March 2007. ↑ "A poet in New York", Dawn, 9 December 2007. ↑ Afro-Asia in Pakistan Archived 13 January 2009 at the Wayback Machine. Hasan Mujtaba, Samar Magazine, Issue 13: Winter/Spring, 2000. ↑ Bhurgari, M. Hashim (24 October 2009). "Sheedi basha hum basha: black people dance away sorrows". Dawn. Retrieved 16 October 2012. ↑ "'Sheedis have been hurt most by attitudes'". Dawn. 23 June 2008. Retrieved 30 December 2013. Sindhi Sheedis call themselves Qambrani, out of reverence for Hazrat Qambar, a servant of Hazrat Ali (AS). ↑ Mishra, Rakesh K. (2009). Chromosomes To Genome. I. K. International Pvt Ltd. p. 183. ISBN 9380026218. ↑ Narang, Ankita; et al. (15 July 2011). "Recent Admixture in an Indian Population of African Ancestry". American Journal of Human Genetics. 89 (1): 111–120. doi:10.1016/j.ajhg.2011.06.004. Retrieved 18 December 2012. ↑ Guha, Saurav; et al. (25 January 2012). "Implications for health and disease in the genetic signature of the Ashkenazi Jewish population". Genome Biology. 13 (R2). doi:10.1186/gb-2012-13-1-r2. PMC 3334583 . PMID 22277159. Retrieved 5 January 2014. ↑ "Sidi lights". Mint. 8 March 2013. Retrieved 17 March 2013. Wikimedia Commons has media related to Siddi people. "Karnataka's Indian-African Tribe", The Wall Street Journal, 26 March 2012. Alice Albinia, Empires of the Indus, W. W. Norton & Company, 2010, 52–78. Shanti Sadiq Ali, The African Dispersal in the Deccan: From Medieval to Modern Times, Orient Blackswan, 1996. Ababu Minda Yimene, An African Indian Community in Hyderabad: Siddi Identity, Its Maintenance and Change, Cuvillier Verlag, 2004, p. 201. Omar H. Ali, The African Diaspora in India, Schomburg Center for Research in Black Culture, The New York Public Library. Abdulaziz Y. Lodhi, "Bantu origins of the Sidis of India", in Pambazuka News, 29 October 2008. "Siddi Jana Vikas Sanga", 5 February 2011. "Black, Indian, and a Hindu", African Connection. "Habshis and Siddis – Africans and African descendants in South Asia", ColorQ World. Shihan de Silva Jayasuriya, "South Asia's Africans: A Forgotten People", History Workshop, 5 February 2011. Zaffar Abbas, "Pakistan's Sidi keep heritage alive", BBC News, 13 March 2002. Andrew Whitehead, "The lost Africans of India", BBC News, 27 November 2000. BBC "In pictures: India's African communities", BBC News.